Factory farming is really all factory and no farm, with emphasis on turning out maximum production units (otherwise known as animals) at the least cost. This translates into horrific physical and mental suffering for sentient pigs, poultry, and cattle, but there’s no money in worrying about that. Whether they’ll be branded eco-terrorists remains to be seen, but given that the industry they’ll be fighting wreaks suffering, death, and destruction on animals, people, and the Earth, there should be no doubt in anyone’s mind who the real terrorists are. Concentrate thousands of animals in an industrial setting–800,000 pigs annually in Shelby’s case should it come to pass (1.2 million according to industry news site SwineWeb, and possibly as many as a mind-blowing 2.4 million according to the Shelby Promoter)–and manure is the going, growing concern. Benign poop dropped here and there to fertilize daisies this is not. CAFOs produce oceans of toxic, liquified manure containing “ammonia, methane, hydrogen sulfide, carbon monoxide, cyanide, phosphorus, nitrates and heavy metals. 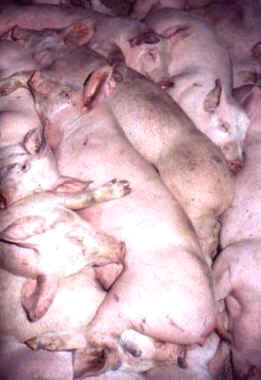 In addition, the waste nurses more than 100 microbial pathogens that can make humans sick, including salmonella, cryptosporidium, streptococci and giardia,” according to Jeff Tietz, author of a compelling, horrifying read, “Boss Hog” (Rolling Stone magazine, Dec. 2006; mega-CAFO Smithfield Foods’ rebuttal here). Factory farming is really all factory and no farm, with emphasis on turning out maximum production units (otherwise known as animals) at the least cost. This translates into horrific physical and mental suffering for sentient pigs, poultry, and cattle, but there’s no money in worrying about that. Mitch Daniels, who took the helm as Indiana’s governor in 2005, earned himself a Meritorious Service Award from the Indiana Pork Producers in 2011 for his vow to double pork production. According to Hat Chat, “the official blog of Hoosier Ag Today,” ”Daniels drew rousing applause when he told the group of livestock and grain producers that he was a Governor that loved pigs.” We assume he meant “love” in the economic–not the emotional–sense, since no one with an actual heart would wish the cruel suffering of a CAFO life and death on a pig–or any animal. As we drove back to Raleigh, grateful to leave the smell behind, I thought about the animals, people, and rural communities and (sic) that had to suffer and sacrifice so we as a society can have cheap meat. But CAFOs spawn more than “just” animal and human suffering and environmental devastation. They game the system to gain huge advantage over the Little People. Proposed legislation in the Indiana General Assembly appears crafted to give agricultural businesses special protections and could discourage citizens from exercising their right to access the courts. House Bill 1091 was authored by Rep. William Friend, R-Macy, and co-sponsored by Rep. Donald Lehe, R-Brookston. It requires courts to award agricultural operations such as confined animal feeding operations, or CAFOs, that are the subject of a nuisance lawsuit with payment of their legal fees. The proposed bill recently passed its second reading in the Committee on Agriculture and Rural Development. But according to Gov. Mitch Daniels, those who were critical of his plan to double hog production are terrorists – “eco-terrorists” (not sure if that qualifier hurts or helps). His Big Ag allies at the Animal Agriculture Alliance even found a way to insinuate an outlandish Al-Qaeda link to further tarnish the efforts of hard-working rural people fighting to protect their lives, investments, and resources. Despicable? Yes, and it reeks of hysterical desperation.